is Back in An All-New Disney Channel Original Movie! Synopsis: After all those years stuck in a tower, everyone’s favorite “barefoot princess” (Mandy Moore) yearns to make up for lost time. 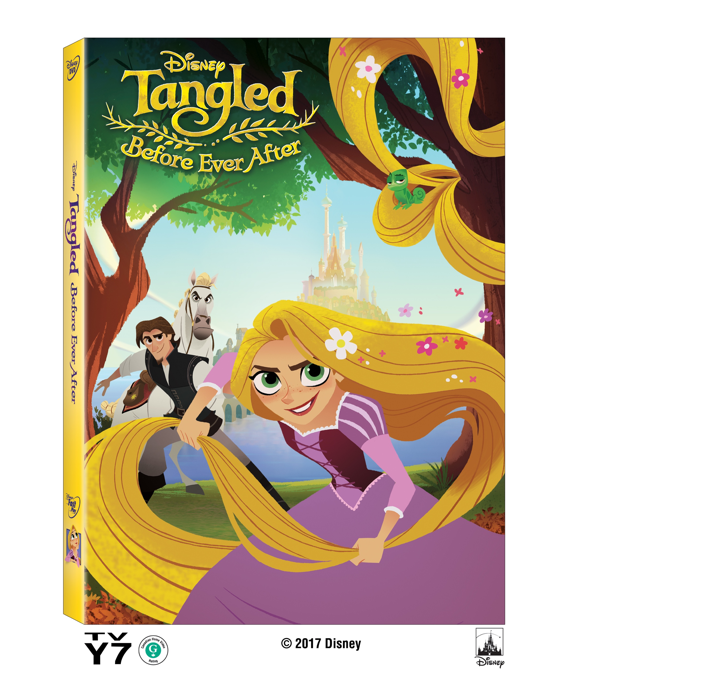 With the help of her true love Eugene (Zachary Levi), pals Pascal and Maximus and daring new friend Cassandra, Rapunzel postpones her wedding and royal duties to defy danger and boldly explore life beyond Corona’s walls. Sparkling with fun, adventure and music from the legendary Alan Menken,Tangled Before Ever After is a magical movie event!! Voice Cast: Mandy Moore (“This Is Us”) as Rapunzel; Zachary Levi (“Chuck”) as Eugene, formerly known as Flynn Rider; Eden Espinosa (Broadway's "Wicked") as Cassandra; Julie Bowen ("Modern Family") as Rapunzel's mother, Queen Arianna; and Clancy Brown ("Sofia the First") as Rapunzel's father, King Frederic. Our little girls LOVE this movie and never get tired of watching it again and again, as it is already a favorite of theirs. They love to sing along as repunzel and her friends go on her amazing adventure outside the castle walls! We like that she is as brave as she is beautiful and her magical hair is the envy of all the girls in our house! I find myself singing the songs during the day and we known to break out in theatrical song during breakfast! I think this is a delightful movie that our whole family enjoys and would make a great gift any time of the year! Sounds like a great movie, can't wait to see it.